It might be taking my work home with me, but as a communication specialist I find a catchy and matching party invitation a must-have. My uber creative friend PS Dre designed these invitations. You could easily make these yourself by printing on parchment colored paper using a nice medieval font type. We used serrated scissors to make it look even more authentic. The wax seal style sticker she designed was the icing on the cake. I printed these on sticker paper we found at the crafts store and cut them out. Money: € 5+ stamps and a gift for PS Dre. To keep things simple, I outsourced most of the party activities to Zap in Zuiderpark. It’s a nonprofit foundation that rent out boating gear at the park and organize birthday parties too. Junior chose their multi outdoor party with kayaking and treasure hunting as most Ranger Apprentice proof. A party for a maximum of 10 kids sets you back a €100, a decision quickly made. What I didn’t realize was that Zap in Zuiderpark is run by students. Not being students of any physical studies, education or children. Nope. guide Jordan studies Technical Business Studies and guide Mo is a student Accountancy. That’s nice. For their resume. Not so much for the quality of the game. 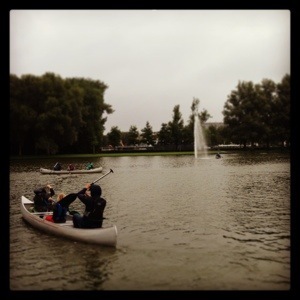 In hindsight: it would have been easier, cheaper and more fun if we rented 3 kayaks, organized our own treasure hunt and brought our own drinks and food. It doesn’t matter for the boys of the party though. They’re having heaps of fun by rowing through the fountain and getting completely soaked. As a quality time invested, Junior, Hubby and I made bows, arrows and quivers for the party. We made the bows out of pvc tube, pipe insulation and mason line, following the instructions of this wonderful tutorial by Ikat Bag. The boys their only job was to tighten the bows, but they find it quite difficult. It would have been more fun if we made ready-to-play bows. We used A3 sized poster tubes as quivers. As a bad weather activity at hand I thought of decorating quivers. But there’s no need, and with boys its all about functionality. A yard of elastic band is taped to the tube, ditch the top cover of the tube, fill your quiver and you’re good to go! Hubby was so kind to act as Archery Master for safety reasons. Those pointy ends of the arrows don’t make for safe playing, but shooting each other is want they really hoped to do. Maybe I should have followed Ikat bag’s tutorial for arrows to the letter and made a softer arrow point. What I didn’t do, but would have if I organized my own treasure hunt, was hanging targets of animal pictures in the park and giving them a scorecard with the pictures. The boys could have then gone on a shoot-and-run-race. No Ranger’s Apprentice is complete without a cape. I made 10 out of garbage bag and duct tape. Those were quickly ditched though. 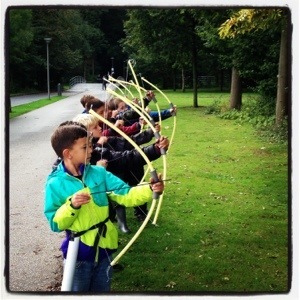 Geld: € 10 (bows), € 5 (arrows), € 10 (quivers) €1 (capes) for 10 kids. Easy peasy. No printables, no dessert table, no party themed food, no cake. The party arrangement includes drinks and a bag of crips. We brought extra food with more soda pops, home made blueberry lemon muffins and snack sausages. It’s more than enough to satisfy 9 year old boys! No goodie bag, just one gift. 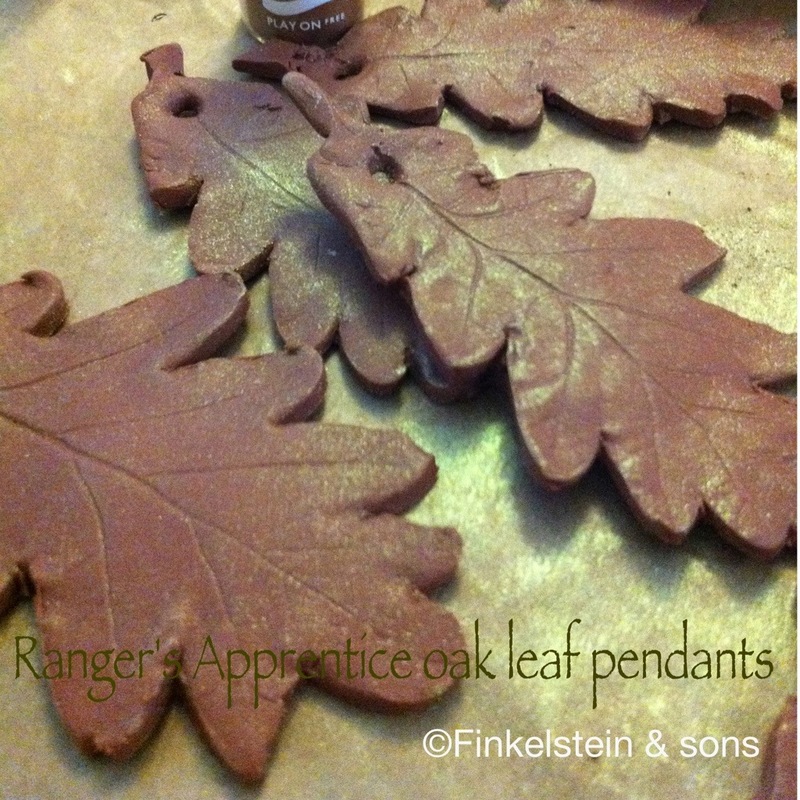 Junior and I made bronze oak leaf pendants out of polymer clay. We rolled out the clay to 5 mm thick and used a real oak leaf as template. If you press hard enough, you get this natural veins stamped into the clay too. We then cut it out with a knife, made a hole in it for a cord and baked them in the oven to harden. A suede cord makes it a real pendant that we gave Junior’s friends at the end of the party. So, there it is! This is how I organized a Ranger Apprentice party for 9 year olds. Do you have any cool ideas for this party theme? Please let me know in a comment!